When Is Daffodil Planting Time in Tennessee? How Long Will Daffodils Last? Plant daffodil bulbs to a depth of three times the height of the bulb. Small bulbs require 2 to 3 inches in depth, while large bulbs need to be planted 6 to 8 inches deep. Use a garden spade, and dig up the daffodil after the foliage has died. Try not to damage the bulb as you dig and lift it from the ground. Look to see if the bulb is a single bulb or a bulb mass. If it is a single bulb, replant it. If it is a bulb mass, shake off the excess dirt. Hold the bulb mass in one hand. Use your other hand, and grasp onto a single bulb. Gently shake it until it becomes loose and frees itself from the original bulb. Repeat the process with each bulb. If the bulbs are stubborn and will not free themselves from the original bulb by being shaken, run the entire bulb mass under running water and shake them free. Plant the freed bulbs and the original bulb back into the ground. Place the bulbs in the ground at a spacing that is ascetically pleasing to you at a depth of 5 to 6 inches. Cover the holes with soil. Water immediately. Plant daffodil bulbs in the fall, to ensure color in the spring. Plant fat side down, point end up, in a hole that is twice the depth or width of the bulb. The best time to transplant daffodil bulbs is in the fall, after they have bloomed and the flowers' leaves have stopped actively growing. The next best time to transplant daffodil bulbs is in the spring. Daffodils need a well-drained, sunny location. Most require at least 5 hours of sunlight a day. Daffodils can be planted in a shrub border, perennial garden or in a bed of groundcover plants. Plant in groups of three to 12 bulbs of one variety for the most natural effect. Daffodils need time to develop their root systems before the advent of winter weather. The University of Missouri Extension recommends mid-October as a good cut-off date for planting daffodils. In warmer areas, planting time may be extended by a month or so. Dig holes which will allow the bulbs to rest about 6 inches below the surface. Space bulbs 6 to 12 inches apart, depending on the variety. If desired, mix a complete fertilizer in with the soil. Daffodils do not require heavy fertilization. Daffodils need moisture to establish good root growth. Water the bulbs throughout the fall if there is not adequate rainfall. If you find you still have daffodil bulbs after it is too late to plant them, you can still enjoy them by potting them up to enjoy inside during the winter. 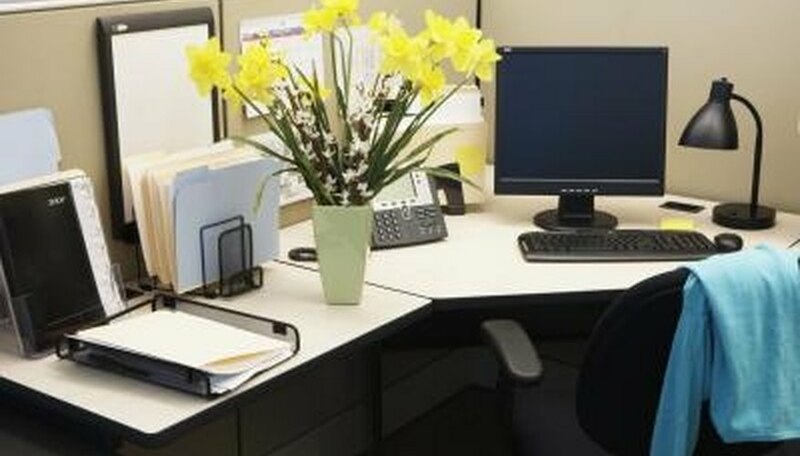 See Resources for "Indoor Daffodils". Dig daffodil bulbs out of the ground with a spade once the foliage begins to die. Rinse off the dirt from the bulbs and pat dry with a towel. Slide individual bulbs into the legs of nylon stockings so the bulbs do not overlap each other. Hang the bulbs in a cool, well-ventilated spot for two to three week until the bulbs dry out. Fill a sturdy box halfway with vermiculite or dry sand. Bury the daffodil bulbs upside down in the vermiculite or dry sand in the box for storage until replanting the bulbs in the spring. Wait until replanting to divide the bulbs by cutting offsets. Cut off any side bulbs (offsets) growing from the main bulb by severing them at their base with a knife and replant the bulbs. The Peruvian daffodil is a tender perennial for containers or climates above 50 degrees F. Plant its bulbs in the spring in full sun under 5 inches of well-drained soil. Loosen the soil in the garden bed with a spade or hand rake. Loosen the top 8 to 10 inches of soil. Dig a hole with your spade to a depth three times the daffodil bulb's length. Space holes 3 to 6 inches apart in rows or circles. Sprinkle bulb fertilizer onto the bottom of each hole to encourage root growth before the first hard frost. Set the bulb in the hole with the fat, flat end on the bottom. Scoop the soil back into the hole. Water the daffodil bed deeply, then cover with an organic mulch such as pine bark or straw. The best time to divide daffodils is after they've started to die in the late spring. To do this, dig around the daffodils and take out a clump of bulbs. Replant sturdy healthy bulbs immediately. Daffodils should be planted in the fall, before the ground freezes. According to the University of Tennessee Extension, this generally means from late September through early November. Planting in the fall gives the bulbs enough time to develop roots before winter temperatures arrive. Remove weeds, grass and brush in an area with full sun exposure in October. Plant while the weather is still nice and the soil is still warm to allow the daffodils to grow roots. Loosen the soil to the depth of 10 to 12 inches with a shovel. Break up large dirt clumps. Remove any buried debris such as rocks and sticks. Spread a 1-inch layer of sand over the soil and a 2- to 4-inch layer of peat moss to add drainage and organic materials to the soil. Add a layer of 1/4 cup of 6-24-24 fertilizer for every 12 bulbs. Mix thoroughly by turning the soil over with a shovel. Dig out the planting area so that the bases of the daffodil bulbs are 6 inches below the soil line. Place the bulbs on the soil with the flat side down and 2 to 4 inches apart. Fill the planting area with soil. Spread 4 to 6 inches of pine needles, wood chips or shredded bark mulch. Flood the daffodil bed with water for five minutes. Water the flower bed once a week during the fall to encourage root growth. 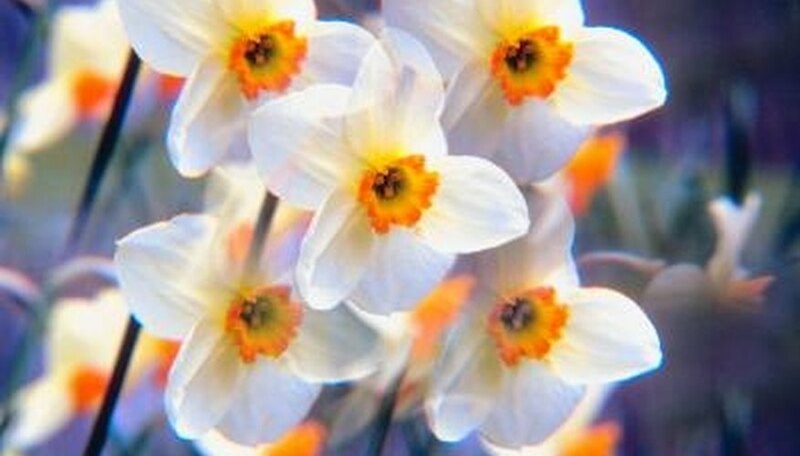 Daffodils, or Narcissus, need to be planted in the fall to bloom the following spring. Cover with one inch of soil and water. Watering will need to be every week for their growing season. White daffodils are often called Narcissus, although "Narcissus" is the genus name of all daffodils. 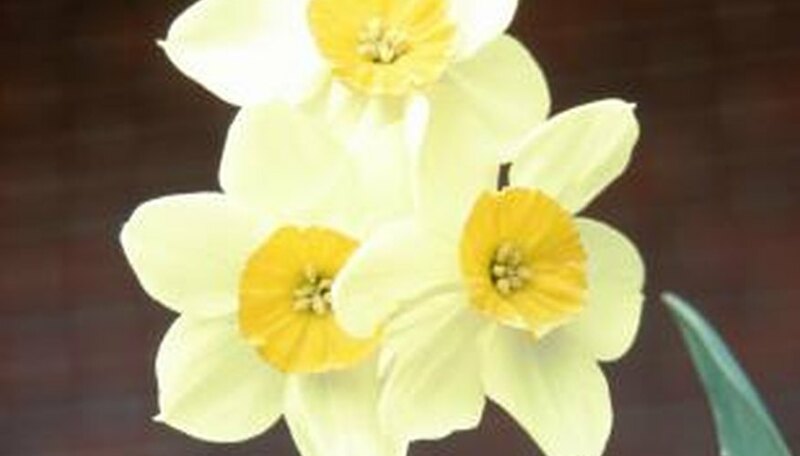 The color can be bright white in some daffodils, or a more creamy, off-white shade. Silver Chimes, for example, has up to 12 creamy white flowers on one stem. Hybrids of the Triandrus species are also usually white. Oranges in daffodils range from a true, bright orange to a pale, almost salmon color. Ceylon is a double-petaled, long-blooming daffodil with orange cups. Geranium has bright orange flowers. 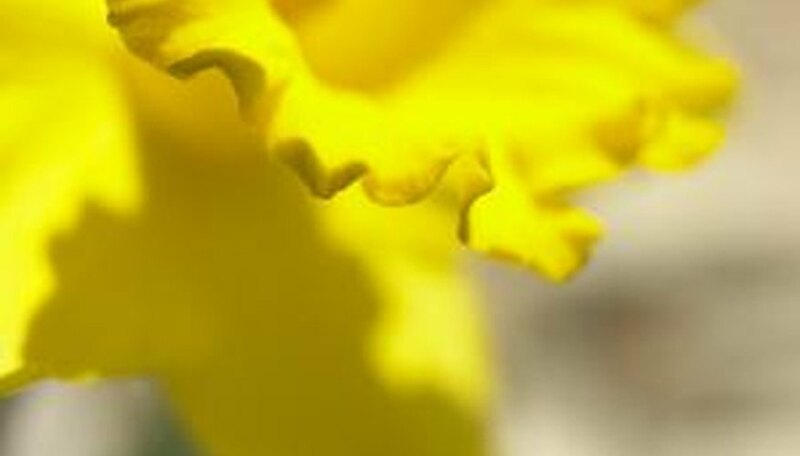 Yellow is perhaps the most common color found in daffodils. 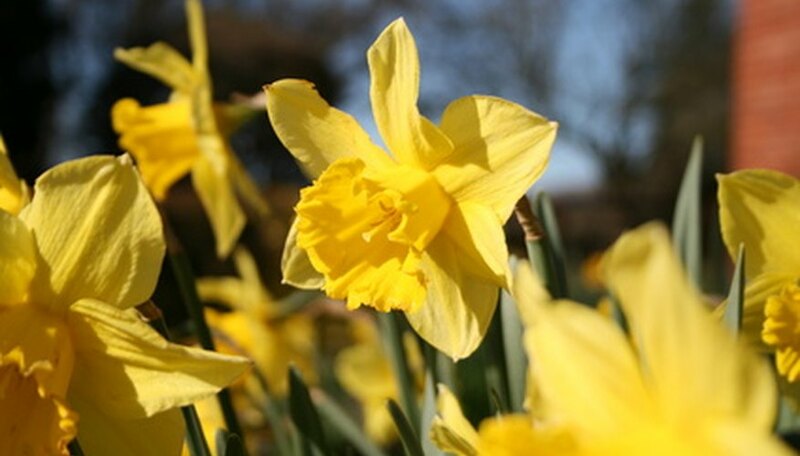 In fact, the most commonly planted type of daffodil, Carlton, features flowers in two hues of yellow. Follies, which is second in popularity to Carlton, has a yellow cup that gradually fades to white as the flower ages. Yellow Cheerfulness features small flowers in lemon-yellow. Red is rarely seen in daffodils, but a few do contain some red in the flowers. Poeticus daffodils, and the Actaea cultivar in particular, feature striking centers edged with a red border. Cabineers have a deep, reddish-orange cup. Many daffodil species and cultivars have flowers composed of several of the above colors. Sir Winston Churchill has orange centers with white petals. Avalanche has white petals that are set off nicely by a pale yellow center cup. Get a forcing glass. The cup is designed to hold the bulb over the water, so the moisture encourages the bloom to emerge. Each forcing glass holds one flower, so get as many as you need for the desired amount of blooms. Turn on the water faucet. Fill the forcing glass with tap water. Make sure the water is lukewarm or cool. Place the bulb on top of the glass container. Place the glass in a cool, dark room, with a preferred temperature of under 50 degrees Fahrenheit. Keep it there for four to eight weeks until you see roots develop. The top of the bulb will also get longer. Check it often for root growth. Add more water the glass if it evaporates. Once roots start to grow, add 1 teaspoon of vodka to the glass. It will stunt the stem's growth so the bulb can stay upright. This will not affect the daffodil blossom. Move the plant to a bright window. The daffodil will soon blossom. Put bulbs of bunch-flowering varieties of daffodils, such as Soleil d'Or or Paper White, in shallow bowls of water. Fill the bowls with pebbles or small rocks. Secure the bulbs in the pebbles. Make sure they are deep enough so they are touching water. Store the plants in a cool, dark place for a few weeks so the roots can grow. Move them to a sunny location once you notice root growth. Daffodils last in the garden for three to four weeks. About a week to 10 days after the daffodil blooms fade away, the leaves start collecting energy for the following year. Removing the leaves at this point will weaken the bulb and likely kill it after a year or so. Allow the leaves to grow until they naturally brown and wither. Trim the brown leaves from the plant and wait until the next spring for the new blooms. It is hard to resist cutting daffodils in the spring when the months of winter are over. If you must cut a few for indoor decoration, they should last in fresh warm water. Expect to keep them for up to two weeks before they shrivel and die. Daffodil plants will live for about five years in one location. After that, the flowers will look weak and small. If you dig up the bulbs, separate them and replant them in amended soil, they should come back in the spring with a renewed vigor. Make sure you allow the plants to grow until the leaves die back. 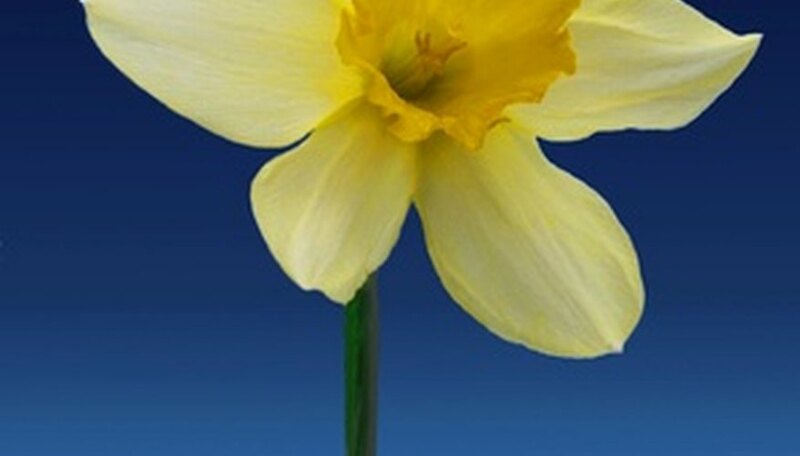 The shelf life of a daffodil bulb is similar to most other flower bulbs. If you store the bulb in a protected environment where the moisture levels are low, the bulb easily lasts one year. After that, the bulb tends to dry out and the chances of successful blooming drop quickly. Fill a container with about 2 to 3 inches of high-quality potting soil with fertilizer already mixed in. Lightly tamp it with your fingers. Containers that are at least 5 inches deep work well for smaller daffodils and ones that are 6 inches deep work well for larger bulbs. No matter the container, it must have a drainage hole. Arrange the bulbs on top of the soil with the tips facing up. Rotate and push the bulbs down a bit into the soil to secure them in place. Arrange daffodil bulbs close together with about 1/2 inch of space in between. Fill the container with potting soil until just the tips of the bulbs are above the soil line. Tamp the soil lightly. In the end, the soil should stop about 1/2 to 1 inch below the container rim. Water the daffodil bulbs well until you see water drip out the bottom drainage hole. Check the soil one or two times a week to ensure the soil remains slightly moist.